Brand new technology brings you the modern design style to your bathroom, elegance products from ELITE provides Grade A Ceramic vessel sinks. Included - ELITE Custom design chrome solid brass umbrella basket pop-up drain with overflow, durable easy clean never cause pipe blockage. 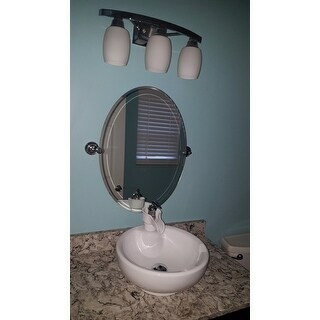 I purchased this sink for the small vanity in my pool bath. I mounted the sink so it is partially recessed into the counter. The included faucet is just cool! 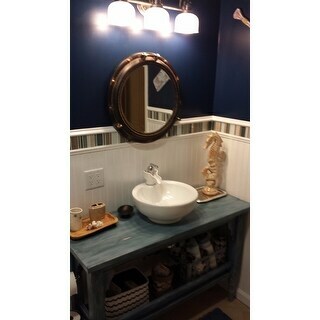 I have not installed this yet, but it is a gorgeous sink and perfect for my small bathroom! Lots of character and charm, this piece! It's a beautiful sink, and looks great in my bathroom... The spout leaks water when"shut off" though. The spout is preassembled, so the problem isn't from installation. It leaks only cold water, so have to have the cold water turned off at the source. Not convenient, but didn't know there was a problem until it was all installed, so can't return. thank you for the fast, free delivery.....it arrived so quickly and in fine shape. I am getting it installed as I am writing this. This is going to be used for the holidays in my guest half bath. I love it. solid sink and looks fabulous! Everyone who comes over wants to know where I got it! Would highly recommend! I've received lots of compliments on this sink over the last couple years. It's held up well and beautiful. I love this sink. It is very heavy and made really well. It doesn't look cheap. Included drain will not fit on a granite countertop. Still have not found a replacement. Sink looks good though. 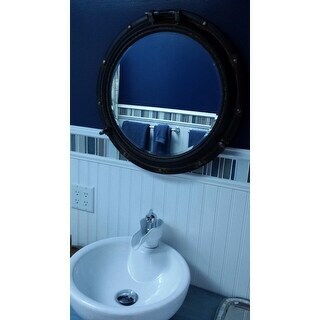 Used this to added to a base cabinet to make a special vanity in my half bath. "what is the dimension/diameter of the base that sits on the countertop"
"Does this sink include the faucet? The description describes the faucet dimensions but the sink description states the faucet is NOT included." Hello marthaintexas, I'm sorry for the confusion. Yes the faucet is included. I will have the wrong information removed. Have a great day! Putting in an upstairs 1/2 bath. We bought a antique wash base cabinet. Want to create an old fashion look. I am remodeling a small main bath. This will be ideal! 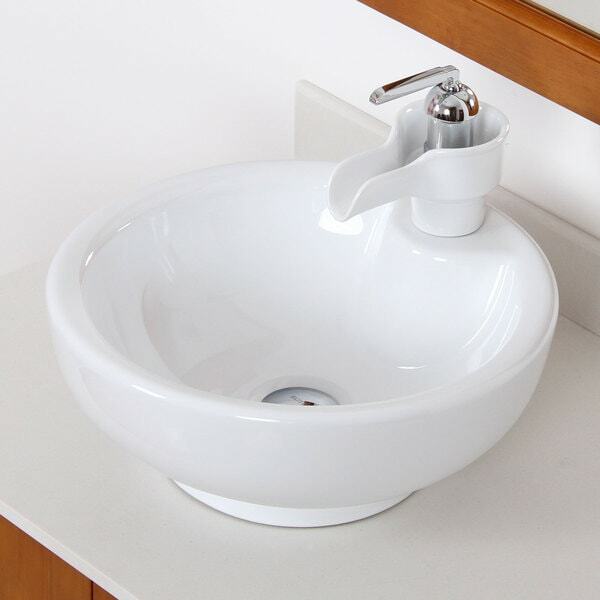 Interesting faucet design with a round vessel sink in white. Will work nicely in my retro bath design installed over a black/white granite counter top. "What is the white part of the faucet made out of?" Hello JJDW, thank you for your inquiry! This sink is made from ceramic. thank you for your inquiry! "I ordered this sink, but it did not come with any installation instructions. Where can I get the instructions?" Hello mmleczynski, thank you for your inquiry; you will be contacted by Customer Care.